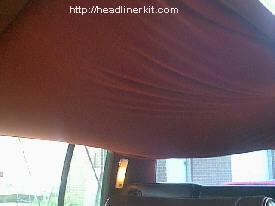 Cadillac Seville headliner repair and replacement guide. 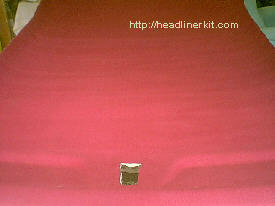 This installation guide is a 1989 Cadillac Seville - the headliner had completely dropped down. 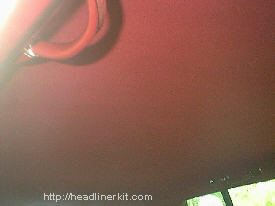 The color we used was 1855 Garnet for this car and a full sized headliner kit. On a scale of 1 to 10 (10 being the most difficult), the Cadillac Seville was around a 5 difficulty level. 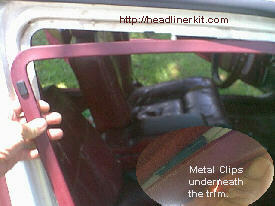 Step 1: Remove the visors and all the molding that holds the headliner in place. 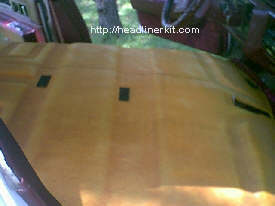 When all the trim has been removed or loosened enough to slide the headliner board free; take it down and let it rest on the seats. 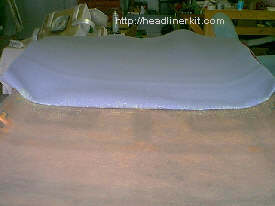 Remove the old cloth and scrap the old deteroiated foam from the board to clean it. [don't try to remove the old glue; as it is almost impossible] Glue the new material to the board 1/2 at a time and replace it in the automobile the way it came out. 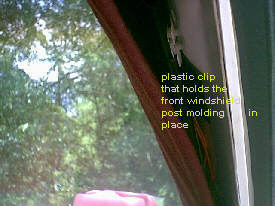 This picture is to show how the front windshield post molding is attached. to loosen the molding; pry it up with a screwdriver (just the top clip; leave the bottom clip in place). You can try to remove it; but it is much easier to just leave it aloose from the molding; the other peice of trim will hold it in place once the headliner is installed again. 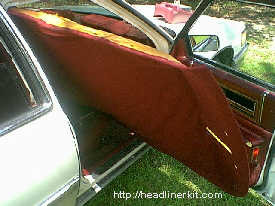 Glue the new headliner on the board; doing 1/2 or 1/3 at a time. When the new material is securly glued to the new board; trim the edges and cut holes for the visors (these holes should be splits in a X) and any other holes that supposed to be in the cloth. 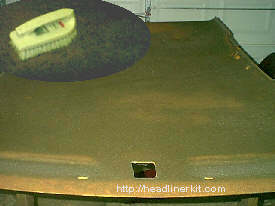 Then replace the headliner the same way it came out. The finished product should look like this.